So ACCESS is no stranger to the mobile world at all. In fact, it bet big and bought PalmSource, the OS software company that was spun off from the original Palm, Inc., back when they still believed there was a future for that OS and that licensing it would be successful. You can tell how successful that acquisition was from the many devices out there now running PalmOS Cobalt — or, as it was renamed, The ACCESS Linux Platform (ALP). Ahem. Now here we are today with Rakuten choosing ACCESS to power the next generation of Kobo reading software! Having seen its mobile browser leadership usurped by the iPhone and then Android, and seen its set-top business go nowhere, and its PalmSource acquisition just drop dead, ACCESS has apparently once again changed tack and gone big into digital publishing. Isn’t it weird how technology companies see a future in the book while the Big Six don’t? What’s significant about that is that it gives publishers what Apple — and Amazon, and Google, and even Kobo! — refuse to offer: A direct line to the customer. But wait. See that fat area titled ACCESS? That will switch to Kobo in this deal. Because Kobo will do the book hosting, DRM, etc. So that direct line to the customer feature is Not For You, Big Six. Unless Kobo decides to add it. 1) What happens to all the Kobo devs who were assigned to its own reader software? 2) What platform is the new hardware reader software running on? Is it going to be put on the existing underlying Linux of the Kobo eReader? Or is Kobo about to switch to Android for its hardware? Android is what powers the Kobo Vox (and I’ve been saying the Kobo eReader should switch to Android too, to get some of that Nook Touch rooting action). Someone will need to get ahold of a Japanese version of the Kobo eReader (or we’ll need to rely on blogs from Japan) to determine this. 3) ePub3 capabilities are very important to the Japanese market because of the special typographical characteristics of that language. But what will that really mean in the English-language market? Will the eInk Kobo eReader contain only a subset of ePub3 capabilities — such as forgoing multimedia possibilities? 4) I don’t see the word “exclusive” anywhere. So is Kobo vulnerable to competitors also licensing from ACCESS? We’ll have to see what the full ramifications of this will be. Too much is still unclear. But for ACCESS, this is a huge win and now they’re back on everybody’s radar after being off it for so long. PostScript: Re-reading the announcement, I’m wondering if this is any big deal at all. One way to see this is as a Japan-only deal. Which means, outside of Japan, it might be business as usual for Kobo. We will have to see. In addition to licensing NetFront BookReader v1.0 EPUB Edition for the kobo Touch, ACCESS, as a content aggregator, will provide the viewer engine for EPUB 3 compatible apps. 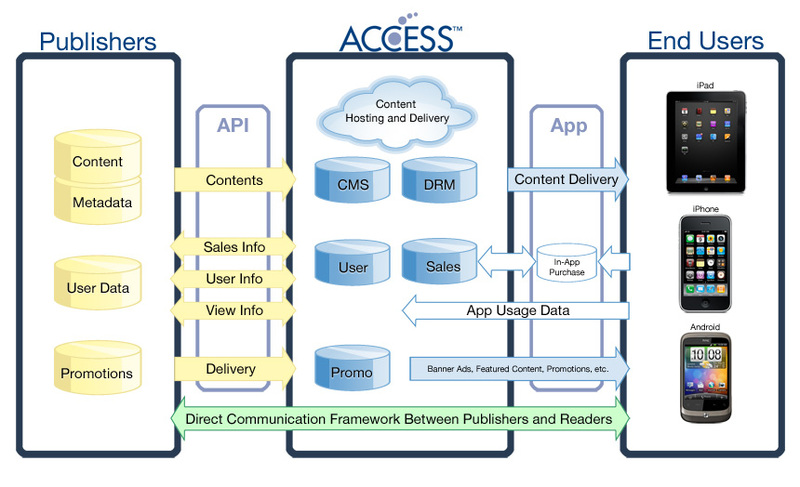 In that diagram above, it seems ACCESS will do the ACCESS part after all. Kobo won’t be hosting the files. I can’t see that being anywhere except within the Japanese market.